But let's face it: almost everybody does it. So perhaps the time has come for the public health message to focus less on advising against it and more on advising how to do it more safely. For instance, a recent survey, “Listening to Mothers III,” found that about 41 percent of new mothers report that they always or often share a bed with their babies in order to be closer. A 2007 study in Los Angeles County found bed-sharing rates in the range of 70-80 percent across races. And it's likely that bed-sharing rates are grossly underestimated. In so many ways, sharing a bed with your infant makes sense. "There is no way I would have had the energy to get out of bed 3-5 times per night to go feed [my baby] in another room," says Lee, a Boston mother who asked that her last name not be used due to what she says is bias against bed-sharers. There's no denying that there can be risks involved in sleeping in the same bed as your infant. In my work as a pediatric sleep consultant, I often heard similar messages from families. There's often a sense of trepidation, fear or shame around bed-sharing, due in large part to messages from public health organizations that suggest bed-sharing is an ignorant choice tantamount to child abuse. A City of Milwaukee public health campaign poster. 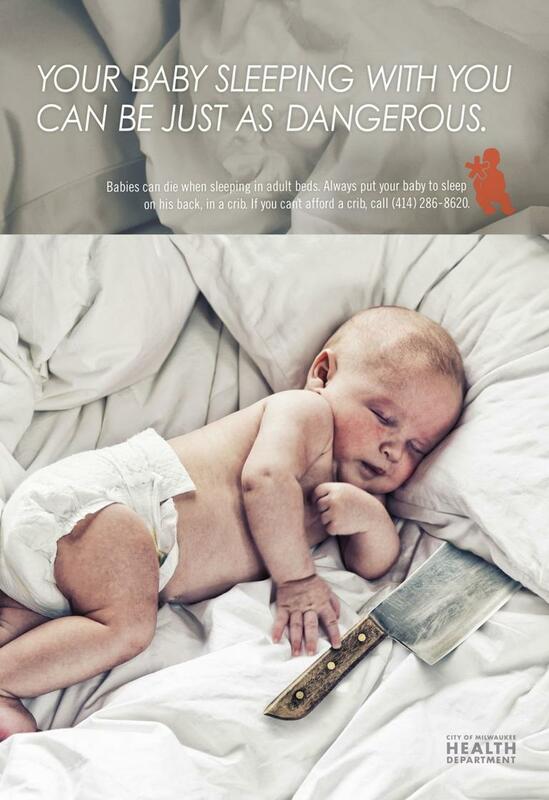 Another disturbing anti-bed-sharing poster equated a mother’s presence in bed to that of a dangerous weapon: it showed a baby sleeping next to a large metal cleaver with the words, “Your baby sleeping with you can be just as dangerous.” Really? The risk factors that can make co-sleeping unsafe are very clear. They include: smoking, not breastfeeding, the use of prescription medications, illegal drugs or alcohol, obesity, sleeping on soft surfaces like couches, and using loose bedding and pillows. But according to a bed-sharing expert, Dr. James McKenna of the University of Notre Dame, there is evidence that by removing these risk factors, bed-sharing in and of itself is not dangerous. At a recent conference in Boston, McKenna explained that shared sleep between a mother and her nursing infant has many protective factors against unexplained infant death. Close proximity during sleep between a mother and her nursing infant helps regulate the infant’s body temperature and breathing patterns, and creates a healthy synchronicity between the mother’s and infant’s arousals at night, he said. This is because human infants have evolved to be perfectly adapted to their mothers’ bodies. Bed-sharing has also been shown to promote successful breastfeeding, which significantly reduces the risk of SIDS. Out of the millions of years of human history, the short time in which our modern culture has separated infants and mothers in various ways does not change the truth of our biology. McKenna asserts that families have the right to be informed about the benefits of co-sleeping, and that a one-sided directive against it is disrespectful and even dangerous. He says his research shows that family sleep environments are fluid, and that most babies sleep in multiple locations, including the parents’ bed. Sarah Kerrigan, M.A. is a Child Development Specialist, trained pediatric sleep consultant, and the mother of two young children. This program aired on November 8, 2013. The audio for this program is not available.